Final week I confirmed how I made a Kerfmaker jig. 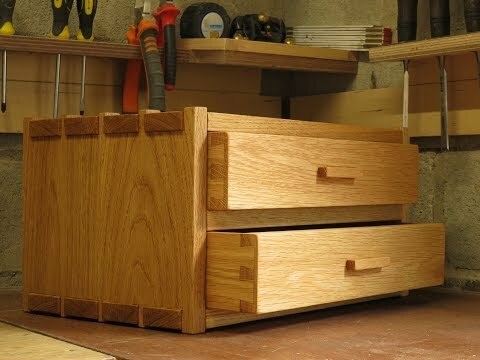 I made it to assist me construct some drawers, so on this video I am going to present how I exploit it to make these drawers. Some instruments used on this video had been offered to me, all opinions are my very own. Nice video. Clear directions especially the kerf maker. Thanks for sharing. Confession…I didn't need a lesson on making drawers I watched just to hear her pronounce the word! I love how you say it! Great lesson and build though! Thanks for sharing. After the stupid comments in the last video about your accent, this is the perfect Follow Up for them. Keep up the great work! Great video as always! I love your channel, you are very inspirational, you motivate people to get up make something. I'm a DIYer. Thank you for sharing your videos. Tamar you forgot one thing…Just look at other posting I have done to you for what I am talking about. Great video! Question, is there a reason why the back seems to be inset a bit? Once again, awesome build. For my own curiosity, was there a reason you chose to use the table saw for the dados and rabbets instead of the router?
" The Draw" ?, are you from new york ? or where are you from ? Hi Tamar, great lil video. I'm really very surprised how many people commented on your pronunciation of "drawer" I'm guessing they never spoke with a long islander before..lol they need to get out more often. Keep the hits coming! Love your accent……maybe you should do a tips and tricks type video to help all of us that hate MATH!!!!! !……I love woodworking, but damn it gives me a headache sometimes. Tamar, You are a blessing, I did scavenge through John Peter's draw making videos to fish out the one you were referring to in an earlier video, He has quite a few, but this one of your's tells me exactly what I need to, I need a lot of hand holding at each and every step as I am trying to get into woodworking, This one of your's does just that. Thanks a million. Woodworking, handmade lumber package with compartments,using main-stream practices.